Having just been restored and re-painted, this Esso tanker was delivered to the depot in Aldrington Basin. The driver left the vehicle and went to the office, to check in. All good so far. What he didn’t notice, was that he had left the brakes off. 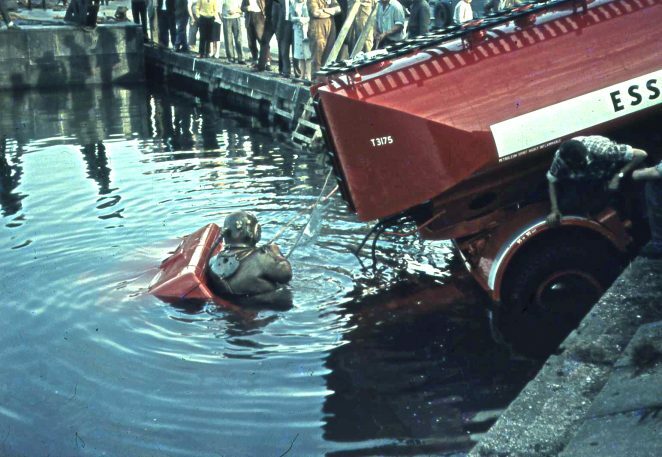 Consequently the tanker gracefully slipped into the water and that terrific paint job got an unexpected dipping. Unfortunately we don’t have any record of what he said when he found it. But maybe, as this is a family friendly website, that is a good job.